All done except the quilting that is, I don't quilt my own tops, but here's the flimsy. 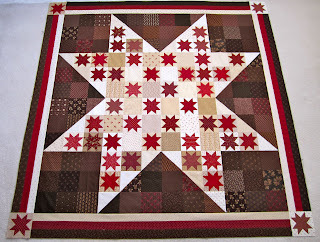 For those of you stopping by for the first time, or the first time in awhile, this quilt was made from the pattern Nottingham Star by Grace's Dowry Quilts. This is Lifetime Quilt # 62. It finished at almost 70" x 70" and has approximately 894 pieces. I went with 4 different creams, reds, browns and stars. Really, the whole project went together like a dream, and it seemed to go quickly for me. Once this top is quilted, hopefully by next fall, I plan to put it in the middle of my kingsize bed, on top of a cream coverlet. As I mentioned yesterday, I've gotten a few questions about how much fabric to buy. It's still hard for me to know how much of a new fabric to get, when I don't have an exact pattern in mind. Or look at this project, I made it from fabric I was collecting for a different pattern, so there's really no exact science to it, especially when you throw in different quilt sizes and little piecing versus extreme piecing. So from now on, when I finish a project, I'll try to give some additional information about the amount of fabric I used. I have heard that when you see a fabric you like for a background or a border, 3 yards is a good amount. Route 44 needed 3 yards of the background fabric and 3 yards of dot fabric, so that rule held true for that quilt, which was around 75" x 75". I've yet to use a whole fat quarter bundle on a project, so I'm excited about Moda's new fat eighths bundles. One of those bundles with 3 yards for the border should make up a nice size quilt I would think. I once got a note from a pattern designer asking me to remove some information I provided while working on one of her patterns. She thought I shared too much information and was breaking copyright laws. I had no problem removing the information, if I designed a pattern, I wouldn't want someone giving away all the details either, so I'm not going to provide the exact fabric requirements from the pattern, but they are more like guidelines to me anyway. The pattern called for 4 different brown, cream and red fabrics.....that wasn't near the amount of variety that I wanted in my top. I probably went with 15 different browns, 20 different reds, and 20 different creams. 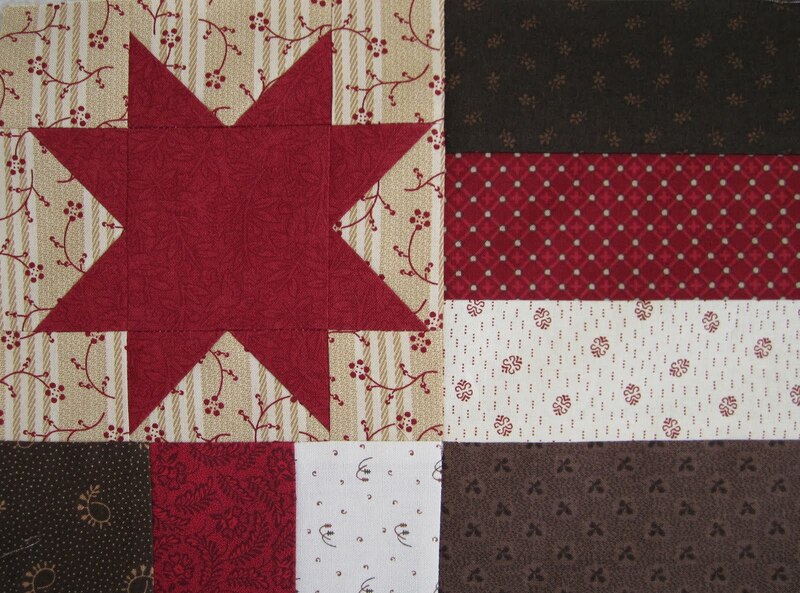 You could easily make this pattern from scraps in your scrap basket. I would say 16 fat eighths of the reds , 24 fat eighths of creams and around the same for the browns would give you ample fabric and plenty of variety for this project. I hope you find this information useful. It looks wonderful, Thelma! Seems like it was quick and easy to put together. Another great finish! So pretty! I think this is another favorite. But then again, all your quilts are my favorites! Another beauty!! 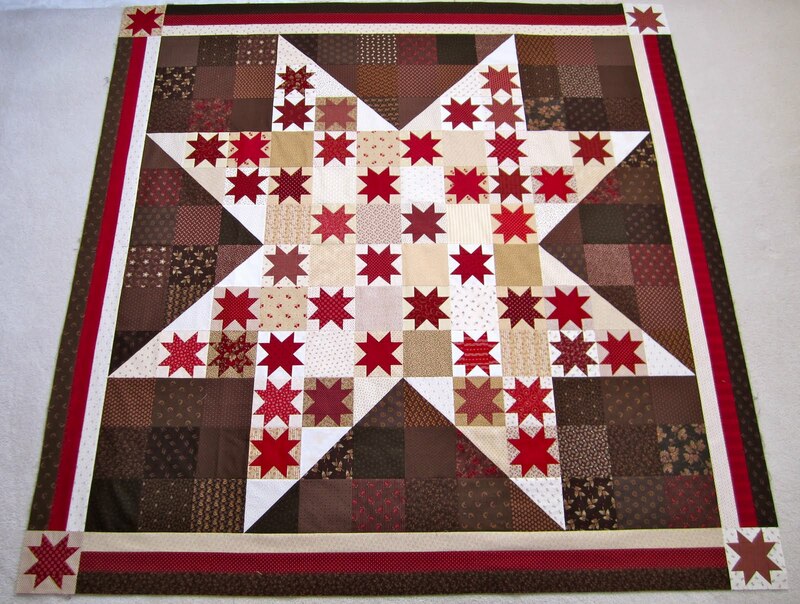 Love the design and all those little stars sitting within the big star. Terrific finish, Thelma! Thelma it is BEAUTIFUL!!!!!!!!!! !Great fabric tips! Oh Thelma...you did a beautiful job! I really, really like this quilt and the colors that you chose. I may have to put this quilt on my to do list. Can't wait to see it quilted. Wonderful quilt & colours choice. Hugs from France. As always your quilts do not disappoint! It's a beautiful quilt! I just love the variety of red, browns and creams you used. I think you're the fastest piecer alive! That quilt went together fast! I love it! Thelma your quilt turned out beautifully. I lvoe the color combination. It will be gorgeous once quilted! i hafta admit - i didn't think i was gonna like this one - i am not a fan of red (orange, yes - red, not so much) and red and brown sounded kinda bleck to me - but it is REALLY excellent ... i should have known better ... do you EVER come up with bad ideas?!? I love it! Simply gorgeous!! It is so pretty! Your pictures are fabulous. Every picture clear, and the lighting great. I still struggle with that. A real beauty, Thelma. Quick, too. Nottingham Star is stunning. Congratulations on a terrific color palette switch. 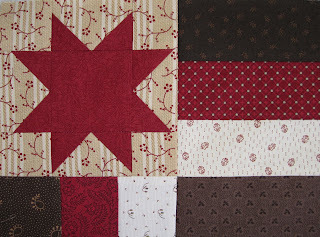 Ditto for Mocha Stars ~ that is going to be spectacular in the Maison fabrics. I particularly like that you've worked in the wovens ~ those are my favorites. You really pulled this one together quickly! I love the way you envisioned Nottingham Star in reds from the beginning. Your version is lovely. Just Beautiful! The evil me wants to say, Send it to me and I'll quilt it (then not return it). Evil Brandie! I know I need to make my own version using yours as inspiration. I much prefer your quilt to the picture you had of the shop quilt. The reds are great! Goodness you are fast! I love this quilt!! I usually don't follow pattern guidelines for fabrics either. LOL Have a happy day Thelma! Great finish Thelma! I really liked your color variation. I'm sure your bed can't wait to get this one. My quilt wish list sure can't! This is prettier than the pattern's cover! Another great job; you're the best! What on earth?!?! You finished this already!?!? Don't you sleep?!? I leave town for a week when I haven't been checking up on you and you've finished a whole quilt! And its beautiful! I am amazed at what you get done. This may be my favorite quilt yet! I am absolutely smitten with this quilt! Head over heels in love with it. I love that color combination. Dark and dramatic, but so striking and welcoming. Just love it! I'd say I'd love to add this pattern to my "Someday" list, but let's be honest, I have a list too long to ever happen in this lifetime. Till then, I'll admire yours. has conseguido sorprenderme.Fantastico... hacía mucho tiempo que no me impresionaba tanto un quilt. Un besazo desde España.